Women's zip back sweatshirt from MINKPINK. 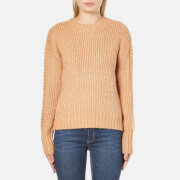 Cut from soft, chunky knit fabric with subtle flecks, the 'By The Fire' jumper features a ribbed crew neck, long raglan sleeves with ribbed panels, and an exposed zip to the rear that opens from the bottom. Complete with a chunky ribbed hem. 55% Acrylic, 25% Polyester, 20% Cotton. Model is 175cm/5'9 and wears a size S.